Select ENGINE 12A - Single pin, 1pc. 12A - Single pin drilled, 1pc. 12A - Pair of pins, 2pcs. 12A - Pair of pins, 1 drilled/one solid 13B - Single pin, 1pc. 13B - Single drilled, 1pc. 13B - Pair of pins, 2pcs. 13B - Pair of pins, 1 drilled/ 1 solid 20B - Single pin, 1pc. 20B - Pair of pins, 2pcs. Our Solid Dowel Pins provide an easy, cost effective aid to hp and “ping” loads causing plate cracking or engine damage from loss of clearance from engine flex. 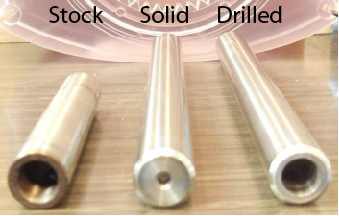 Our super strong proprietary material has been meticulously machined to provide what we feel are the most accurate and consistently machined solid dowel pins on the market. The O.D. is accurate to 50 millionth’s! That’s 0.00005”. We “lightly” tapped one end for use with a Dowel Pin Puller. For Medium hp levels (up to 400whp) we offer a drilled pin for use in the upper location. This allows you to get the maximum benefit without the need for any machining necessary with using a solid upper dowel pin.